This was another quick-build that I wanted to build right from the box with little or no alteration on my part. 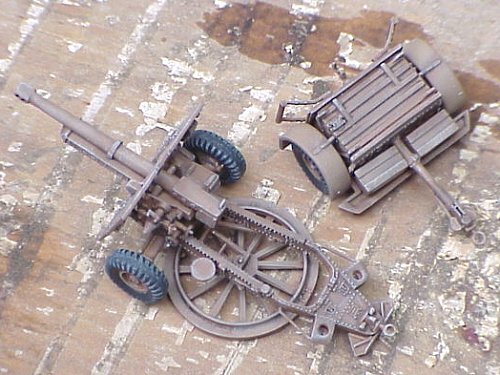 The level of detail on this cannon was superb, making it a perfect candidate for a quick-build. The detail is extremely fine, with ample number of rivets, boxes, cables, and all sorts of things that I cannot identify. Another reason for me building this straight from the box is my lack of reference material on this gun. Consequently, I have no idea on the scale or detail accuracy of the kit. Although the construction was very straightforward in theory, the actual execution was not so smooth. 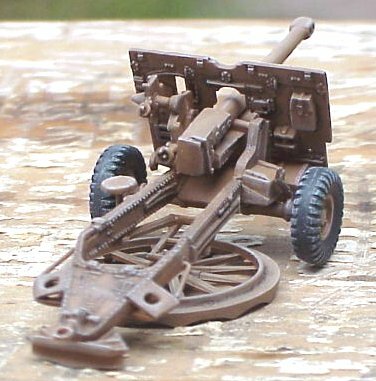 The left and right support arms, which extend back from the cannon mount, have a large attachment point at their rear, and pinch the cannon between them at the front. When gluing these together, I lined them up from the rear, and made sure that they fit nice and snug, but the result was that the front was very crooked. Due to this one misalignment, the wheel axle is crooked, the gun had to be glued on an angle so as not to appear crooked, and one of the gun shield supports had to be lengthened to avoid the shield going on crooked (when viewed as perpendicular to the gun). So... when you build your kit, do not glue the two support braces together at the rear, until you have the front pieces all lined up and glued together appropriately. The gun has two options for the muzzle, one is the twin baffle muzzle brake which I used, and the other is a barrel extension with no muzzle brake. I went for the double baffle for its wickedly good looks, but the fit was not good, and the barrel required some re-shaping with putty immediately aft of the muzzle brake. The muzzle opening at the end was also off-center, so it needed to be filled and re-drilled. 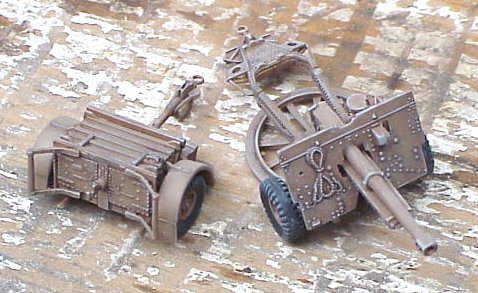 Also included with this kit is an ammunition trailer, which has the same excellent level of detail seen on the cannon. 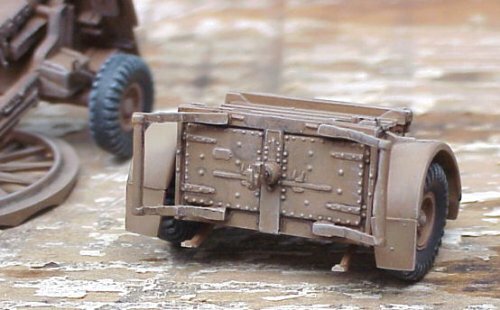 There are spare ammo boxes, some separate pioneer tools to be glued to the trailer and the gun shield, and some cannon shells and cartridges. There are also six excellent crew figures included loading the gun and handling the ammunition. They are very well molded and detailed, and dressed for the Eighth Army in Afrika (or Southeast Asia, too, I guess). The box art on the ESCI box shows the ammo trailer with its doors open and ammunition inside, but the kit does not provide for open doors. They would have to be scratch-built, along with the inside of the trailer. The instructions were very good, except it shows the trailer hitch to be attached upside down. There are no decals included, but I'm not sure if these guns had any markings. 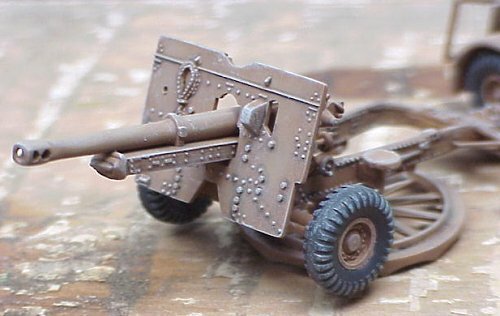 I painted my cannon in a desert tan color (Testors Acryl - excellent paint!) and sprayed a lighter colored tan dust for weathering. Postscript: After I first posted this review, I received a mail from Mark Thomas with some excellent information. These guns were painted a sand color for use in the Mediterranean, while in Italy and Europe it was painted overall green, or with a brown/khaki-brown camouflage. The perforated muzzle brake which I used was seen on late-production guns ('44 onwards), which means that I screwed up on mine (should be green only). Apparently these guns did not sport any markings, and for those of you planning on doing a jungle diorama, the Aussies liked to shorten the gun barrel and axles, to assist in jungle movement. Thanks for the great info, Mark!